Oakland had been without a football team after the Oakland Raiders relocated to Los Angeles before the 1982 NFL season. The Invaders stepped in to fill the void; the similar name was no accident. The team was originally owned by Bay Area real estate magnates Jim Joseph and Tad Taube. 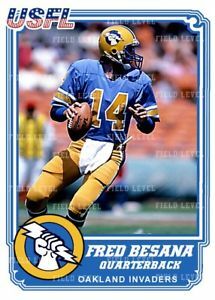 However, after the original owner of the USFL’s Los Angeles franchise, Alex Spanos, bought the San Diego Chargers instead, Joseph and Taube flipped a coin to decide who would buy the Los Angeles rights. Joseph won the toss, selling his stake in the Invaders to Taube. As it turned out, Joseph was forced to move his team to Phoenix, Arizona as the Arizona Wranglers. Taube then approached the Michigan Panthers, who had been one of the league’s strongest teams during its first two years and had by reckoned by some observers as an NFL-quality team. However, Panthers owner A. Alfred Taubman was a strong supporter of spring football and was not willing to go head-to-head with the Detroit Lions. Taubman and Taube quickly reached a deal for a merger. Although the Invaders were the surviving team, Taube sold controlling interest in the merged team to Taubman while remaining chairman of the board. The merger was formally announced after the owners approved moving to the fall. 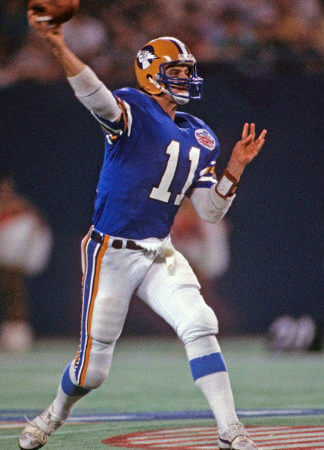 The new team, bolstered with key players from the Panthers such as Bobby Hebert, went 13-4-1 in the regular season and advanced all the way to the 1985 USFL championship game. The championship game was a rematch of sorts with Chuck Fusina’s Stars, who now played in Baltimore; the Panthers had upended the Stars in the league’s inaugural title game. The Invaders were in the midst of a potential game-winning drive when a personal-foul penalty derailed their momentum, allowing the Stars to defeat Hebert’s Invaders 28-24, and claim indisputable bragging rights as the league’s all-time best team. Despite reaching the championship game, the team’s attendance fell again, to a barely sustainable 17,509. Soon after the championship game, Taubman decided to pull out. The loss of Taubman’s wealth left the Invaders without nearly enough resources for the move to the fall, and they suspended operations for the 1986 season. As it turned out, the championship game was the last USFL game ever played, as the league was effectively killed by an antitrust suit against the NFL in which it only won $3 in damages. The Oakland Invaders were a professional American football team that played in the United States Football League (USFL) from 1983 through 1985. Invaders – To enter by force in order to conquer or pillage. A group that invades a country, region, or other place. Despite reaching the championship game, the team’s attendance fell again, to a barely sustainable 17,509. Combined with massive financial losses, the Invaders announced they would suspend operations for the 1986 season. Who is the greatest Oakland Invaders?